Shania Boards - Hamilton Pictures!!!!!!!!!! Last edited by Jud : 09-25-2003 at 11:40 PM. Last edited by cbspock : 09-25-2003 at 08:56 PM. I wonder if we'll see pics of all 4 outfits? That outfit sure doesn't look "sporty" though. But I'm not complaining! LMAO! You never know....they may move..
:LMAO :LMAO :LMAO at Chris and the tribbles comment! We're so mature, aren't we? Gentlemen......pleeeeeease! LOL! We all know that Shania is blessed in a certain area, and sometimes that area tends to move when she does. I can't wait to read the reviews. I want to know what the set list is. We should definitively show this thread to Shania some day...LOL! 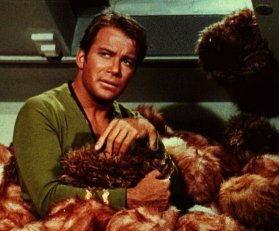 Spock - fortunately for you, Tribbles like Vulcans & Humans. Just don't feed them, or they will multiply quickly. I think the guys would have to cover their blushing faces, lol. I was talking about her jewelry bouncing around, of course.